Award-winning MSDSonline SDS and chemical management solutions from VelocityEHS make it easy for users to prepare for and manage global hazard communication (HazCom) regulatory compliance requirements, including those impacted by the Globally Harmonized System (GHS) – perhaps the most significant regulatory change to hit the EHS industry. 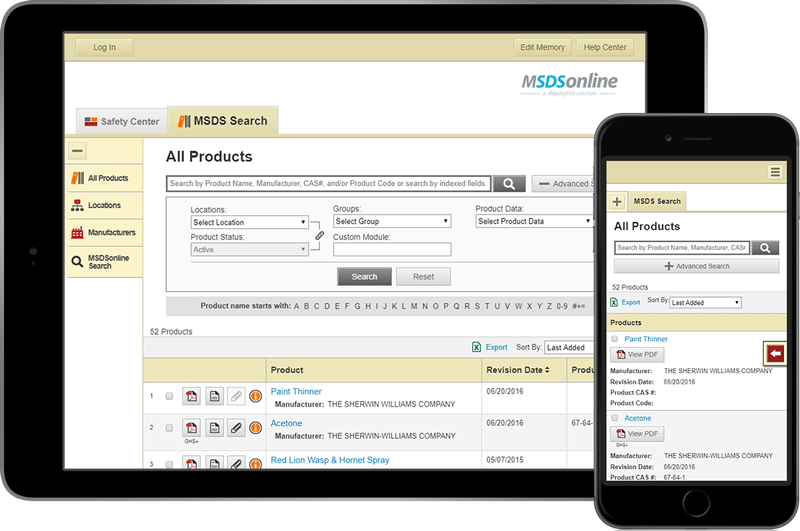 MSDSonline Chemical Management accounts – including our popular HQ Account – provide millions of safety data sheets at your fingertips, a simple way to provide employee right-to-know access to critical safety information, robust capabilities for creating GHS-aligned workplace container labels, and more. You can even provide SDS access offline with our convenient mobile app, enhancing protections for your workers in-the-field or in locations where internet access is limited. To see for yourself how MSDSonline solutions from VelocityEHS simplify SDS and chemical management, contact us at 1.888.362.2007 or sign up for a free trial. Online EHS software from VelocityEHS enables safety professionals to solve their most complex EHS management, compliance and regulatory challenges in simple ways. From our MSDSonline chemical inventory management solutions for safety data sheet (SDS) management, GHS workplace labeling, container management, and regulatory reporting, to our Incident Management, Risk Analysis and Audit & Inspection modules for prevention, tracking and correction of hazards, VelocityEHS software streamlines key processes for ensuring safer, more compliant workplaces. Plus, our web-based solutions are mobile-enabled to make safety management more convenient than ever, and our integrated mobile apps provide yet another way for employees to access and manage EHS tasks wherever they are – even when working offline. Fill out the form on this page to request a demo of any VelocityEHS solution. In addition to providing industry leading EHS software solutions, VelocityEHS is committed to helping EHS professionals stay up-to-date with the latest safety and compliance news through free valuable resources. Visit the links below to learn more.